A visit today to the Castle Dairy for a fantastic Father's day lunch, revealed a set of draw bar slots in the left hand (unused) entrance in the restaurant. I'd never seen these before, despite numerous visits, and I'd certainly never read about them. I therefore thought it would be apt to add this building to the list of potential secure buildings....along the lines of Helsfell Hall in Kendal, and Wharton Rectory in Wharton. Above. Floor plan of the ground floor, showing the location of the draw bar slots, and remains of a spiral staircase. The draw bar slots still contain a draw bar, though there was some furniture stored in front of the door making it difficult to get decent photos. I'll have to go back and negotiate a clean up to get some better pictures. 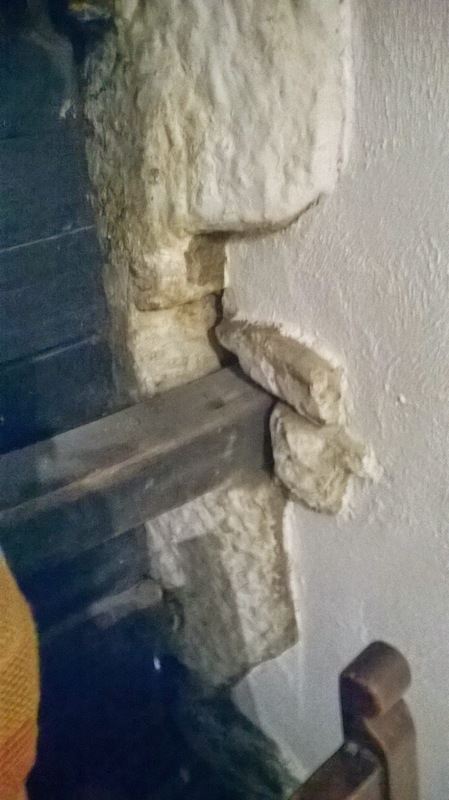 The documentation I've been reading today, also states that there is evidence of a further set of draw bar slots in the wall between the bedroom (containing the 16th century bed and aumbry) and the room that is traditionally thought to be the chapel. Above. The exterior of the door that has retained its draw bar slots and draw bar. Above. The right jamb of the door. Above. 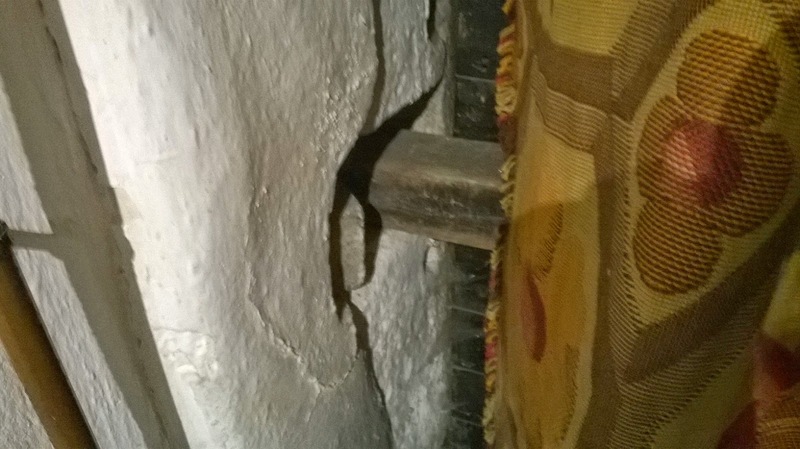 The left jamb of the door. This was the original entrance into the central hall block. The other door, now used as the main entrance into the restaurant, was added much later. It leads down a corridor with three sandstone arches to the left leading into the South West wing, and a single doorway to the right that leads into the central hall and onto the North East wing. The South West wing we see today probably dates from Anthony Garnett's tenure of Castle Dairy. It's therefore likely that there was an additional building to the South West of the central hall, access to which would have been through these three doors....all built during the 14th century. Above. South West facing window in the first floor bedroom. The documentation I've been checking today also makes mention of the small windows that the Castle Dairy is famous for, and seems to intimate that they may have been gun loops, or at the very least, watch-outs for looking North East and South West along Wildman Street......the main road into Kendal from Scotland for a long time. Above. First floor window overlooking the original entrance. Above. The same window from inside the hall. Above. Splayed window looking South West along Wildman Street. Above. Possibly the smallest window in Kendal in the South West wing looking North East along Wildman Street. So from a 'look out' point of view, these tiny windows would provide good views along Wildman Street, North East towards traffic coming into town from Scotland, and South West towards Stramongate Bridge. The building would originally have been in open land, with very few buildings around it, so would have had clear views all around....not hemmed in like it is today. The difficulty comes in deciding whether this building was built with security or defence in mind. In my humble opinion, the features shown here are purely security. There's no evidence of a tower here, as there is at Dockray just up the river, and the Castle Dairy never appears as a fortification in any of the antiquarian maps of Kendal. The secret here could lie in the fact that the Garnet family, who owned the building from the early 1560s, were recusants, people who remained loyal to the Catholic faith at a time when the Church of England was moving away from Rome and establishing its own doctrine and practices. As a result of this, the Garnet family may have instigated the inclusion of certain aspects of security into their home; draw bar slots at the main entrance, small windows to keep watch on the comings and goings around them, and draw bar slots blocking entrance to the room supposedly used as an illegal chapel. In this respect, the Castle Dairy could be the same as Helsfell Hall....a simple home with additional security. The spiral staircase to the rear of the building, if indeed it was a spiral staircase, could just have been an extravagant addition to a home. More research is obviously required, and I'm sure that this intriguing building will be further investigated in the future. Cumberland and Westmorland Antiquarian newsletter, Summer 2011. The Castle Dairy Archaeological Building Record.